This page is dedicated to discussion of screen adaptations of the works of Lawrence Durrell and Gerald Durrell. 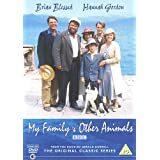 We are delighted to announce that SIMON NYE, scriptwriter for both the 2005 screenplay of My Family and Other Animals and the current Durrells in Corfu series will take part in our “ISLANDS OF THE MIND” symposium, 23-28 June 2019. The second television adaptation (a single 90-minute programme), starring Imelda Staunton (Louisa Durrell), Eugene Simon (Gerald Durrell), Chris Langham (Theodore Stephanides), Matthew Goode (Lawrence Durrrell), Russell Tovey (Leslie Durrell), scripted by Simon Nye and directed by Sheree Folkson. Loosely based on (but not specifically an adaptation of) My Family and Other Animals, this series, screened on UK ITV channel in 2016, starred Keeley Hawes as Louisa Durrell, with Milo Parker as Gerald, Josh O’Connor as Lawrence, Daisy Waterstone as Margo, Callum Woodhouse as Leslie; Yorgos Karamihos plays Theodore Stephanides and Alexis Georgoulis plays Spiro ‘Amerikanos’ Halikiopoulos. Controversial casting is the cameo role for veteran actor Lesley Caron as the fictitious Countess Mavrodaki. “A warm, funny, feel-good series about a family’s adventures on a gorgeous Greek island when they uproot from their English home in the hope of a better life. Based on Gerald Durrell’s much-loved Corfu trilogy of novels, The Durrells sees impoverished but sparky widow Louisa Durrell make the radical decision to seek out a new destiny for her family when her options in late 1930s England seem to be limited to struggling on or marrying a wealthy but dreary older man. Concerned that the lives of her four ‘children’, ranging in age from 11 to 21, are heading down the wrong track, she relocates her reluctant brood to a dilapidated house in the Greek sun. This beautifully-shot series follows the family as they adjust to their new life, face a whole new set of challenges and meet new friends, rivals, lovers – and animals. It has already been announced that a second series is in production. I viewed “The Durrells” with some apprehensions: apprehension number one, because I was concerned lest the film-makers had taken too many liberties with the material, and apprehension number two, because I wanted to avoid as far as possible taking a pedantic and protective approach to the six parts of the serial. No-one “owns” the story of the Durrell family and the years (1935-39) that they spent in Corfu – not even the Durrells themselves – so the way in which they are portrayed becomes a matter for “experts”, historians, Corfiots, and, ultimately, the viewers. Having seen (many times!) both previous television versions (1988 and 2005) I came to this series with some scepticism and I have to say that I was immediately impressed with both the acting and the script itself. And I was won over – on balance – because my enthusiasm for the way the material has been treated and the way it is presented easily overcame my twin apprehensions. It is noteworthy that while the previous versions (both for BBC) were entitled My Family and Other Animals, this new version (for the independent ITV channel) is “based on the Corfu Trilogy” – that is, it purports to take material not only from My Family and Other Animals but also from Birds, Beasts and Relatives and The Garden of the Gods. It is also noteworthy that Simon Nye, the scriptwriter, was also responsible for the 2005 adaptation. The difference between the two versions is that the 2005 was a once-off, 90-minute drama whereas the present series is in six parts, and (as of August 2016) a second series is in production. There are so many points to be made that I will mention only a few. It’s important to realise that Gerald Durrell’s My Family and Other Animals, while faithful to most aspects of the family’s years in Corfu, departs in one or two significant details. In his “Speech for the Defence” with which the book opens, he states “In order to compress five years of incident, observation and pleasant living into something a little less lengthy than the Encyclopaedia Brittanica, I have been forced to telescope, prune and graft, so that there is little left of the continuity of events. Also I have been forced to leave out many happenings and characters that I would have liked to describe”. In a sense, therefore, Gerald was offering carte blanche to any screenwriter who wished to further telescope, prune, graft or, indeed, add (as Simon Nye has done). i) Lawrence lived with the family for only a short period before moving, with his wife Nancy, to the “White House” at Kalami, while Mrs Durrell and the three younger children lived in Perama and Kontokali before moving back to Perama. ii) A second example, possibly connected with the first, is that Nancy does not appear in Gerald’s story at all. iii) The third, also connected with the previous two, is that Mrs Durrell moved her family to Corfu at the behest of Lawrence, who was already living there with Nancy (having in their turn emigrated to Corfu at the behest of their friends the Wilkinsons, with whom they had been house-sharing in England). The idea that Lawrence, in Bournemouth, was the catalyst in propelling the family, en bloc, to Corfu is shared by all three screen versions (and Gerald’s book) but is wholly untrue. It is invidious to single out any actor – or indeed the character they play – but my admiration for three in particular must be expressed: Milo Parker is the centre of the show, and he portrays Gerry superbly. Keeley Hawes brings both humour and gravitas to the role of Mrs Durrell, and in so doing brings the character further centrestage than previous versions, which centred on Larry and Gerry. Admittedly, Hannah Gordon (in the 1988 version) and Imelda Staunton (2005) were hard acts to follow, but Hawes makes the part her own, which is a cardinal quality in any actor. For me, she almost carries the show, but Milo Parker’s Gerry confirms that this is an adaptation of Gerry’s book and reaffirms him as the centrepiece. I also want to congratulate Callum Woodhouse for his sensitive and understanding portrayal of Leslie (see below). Using the “raw” material of The Corfu Trilogy Simon Nye has created a script that is sensitive, amusing and empathetic. For me, he gets the key accolade for reinstating Nancy – not in the “factual’ sense of presenting her, from the outset, in Corfu, but as someone re-entering Larry’s life and finding it so difficult to live with the rest of the family that she demands that they find a place of their own (this could well have been the “actual” reason for their departure for Kalami). Other aspects of the script (Nancy arriving and then leaving) do not enter either the “factual” history of Larry and Nancy or Gerald’s version, but that is an arguable point since she does not appear in the original at all. Simon Nye has done Leslie Durrell a huge service – and compliment – in rehabilitating Leslie (if such a troubled character could ever be rehabilitated) as a thinking, caring, deeply troubled and bewildered teenager. Previous portrayals (and even Gerald’s own) have presented an outsider who is never happy except when he is firing his guns and killing wildlife. Nye’s “Leslie” shows us a boy who is disturbed by adolescence, by his apparent difficulty in joining society, by his need to be understood by his family, and also a boy capable of great affection and concern. It’s a big step towards our appreciation of Leslie Durrell whose subsequent life – and relations with his family – was unhappy and unsuccessful. From what I have gleaned about that life, Nye’s portrait is exceptionally understanding. A further aspect of Nye’s insight into Louisa’s feelings is shown in the way he characterises the role of the taxi-driver Spiros “Amerikanos” Halikiopoulos who, in this version, clearly cares for Louisa. Nye probably knew that Corfiots who knew Spiro have always believed that there was a potential, but unfulfilled, romance between them, and he succeeds in nuancing this very effectively. Unlike the previous incumbents of the role, Alexis Georgoulis is good-looking, young and sexually attractive, and this casting presumably followed the subtext of Nye’s script. It’s often said that films are made by accountants, not directors, and that the importation of a “star” name is insisted on for box-office reasons, regardless of the storyline. When I heard that Leslie Caron (whom I knew only from her 1958 role opposite Maurice Chevalier in Gigi and had not seen since) was to appear in a cameo role as the “Countess Mavrodaki” my apprehensions sprang up in front of my judgements: I assumed that the whole series would be mortgaged to viewing figures rather than apprenticed to fact. But “in fact” Caron’s inclusion/intrusion (as someone who offers Margot Durrell a position as companion) is not as great as some of Nye’s other liberties and actually helps us to understand Margot’s need for a role other than sunbathing and chasing young men (which Margot herself in later life acknowledged were her principal preoccupations in Corfu). The series is produced for ITV channel by an independent production company, Sid Gentle Films. While the production is superb in location, camerawork, casting and “atmosphere” and is excellently packaged and presented, the production company is could have developed a better liaison with local interests. Having known Lawrence Durrell very well, and having met both Gerald and Margot (as well as counting Lee Durrell – Gerald’s widow – and Alexia Stephanides-Mercouri – Theodore’s daughter – among my friends), and having briefly corresponded with Leslie’s son, and having written about all of them, I was anxious to have a discussion with Simon Nye regarding his script. This would have been extremely helpful since at the time of the first and second series I was writing a study of popular literature and how it is “translated” into film and television. Nye, like Andrew Davies, is one of the stars of this industry, and I was sure that talking to – or corresponding with – him would benefit my work. Sid Gentle Films, however, refused absolutely to put me in touch with Simon Nye, suggesting instead that their publicist “could tell me everything I wanted to know”. Dream on. No publicist I have ever met knew anything peripheral to the production in hand, and usually can produce nothing more than a press-pack. This may be an unsound generic judgement, but I doubt very much that any publicist could debate the finer points of comparative screenwriting with any degree of authority. 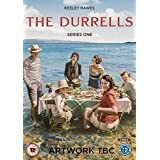 The series “The Durrells” is not only entertaining but, due to the insights of the scriptwriter and the capacity of the actors to make his script very real, it is also a very fine tribute to Gerald’s trilogy. Many visitors to Corfu – especially from the UK and Ireland – come clutching a copy of My Family and Other Animals, sometimes a treasured, battered, copy and sometimes a new one, probably bought for the journey. The number of English-speaking readers of MFOA, most of whom, in my experience, encountered and were captivated by the book in childhood or adolescence, is phenomenal. When we (the Durrell School of Corfu as it then was) persuaded the Municipality to name the garden on the town’s Esplanade as “Bosketto Durrell”, a vital argument was the way that Gerald, through his books and the 1966 television documentary The Garden of the Gods, had given the tourism industry in Corfu an enormous boost. Excluding the numbers of copies in pirated editions in Chinese and Russian (for which no figures are available) at least 5 million copies have been sold in English-language editions. At the Durrell Library I have been amazed at visitors from countries like Estonia who say that MFOA remains a curriculum subject. The success of “The Durrells” can already be measured in its impact on next year’s (2019) UK bookings for Corfu, and local shopkeepers around Perama have already geared up for the extra influx. As such, its contribution to the “Durrell industry” on Corfu can only be welcomed. One might wish that the production company would try, through appropriate and imaginative public relations activity, to put back into Corfu’s cultural life some of the benefits they are gaining from this series and its successor. Profile is to publish a biography of the Durrell family by Michael Haag titled The Durrells of Corfu. Profile editor Mark Ellingham acquired world all language rights to the title which will follow the Durrell family during, before and after their adventures in Corfu. The book will be published in spring 2017 to coincide with the second television series of “The Durrells”. “The Durrells” is a six-part ITV drama television series based on the youngest son Gerald Durrell’s three autobiographical books about his family’s four years on Corfu from 1935 to 1939: My Family and Other Animals, Birds, Beasts and Relatives, andThe Garden of the Gods (Penguin). The Durrells of Corfu will cover the background to the Durrell family’s years in Corfu, including their time in India, where all the children were born, and where their father, a civil engineer, died. It will look at the real life characters the Durrells encountered on Corfu, notably the biologist and poet Theodore Stephanides, and the taxi driver, Spiros Halikiopoulos. Haag will also tell the story of how the Durrells left Corfu, plus Margo’s return to join the Greek resistance, and Leslie’s romance in England with their Corfiote maid and friend, Maria Kondos. Haag is the author of books The Quest For Mary Magdalene and Templars: History and Myth: From Solomon’s Temple to the Freemasons with Profile. He is the author ofAlexandria: City of Memory, with Yale University Press, a composite biography of Forster, Cavafy and Durrell. Forget The Night Manager, the latest sumptuous Sunday night extravaganza is The Durrells, ITV’s six-part series which whisks us off to Corfu in 1935, where the nature-writer Gerald Durrell lived for four years as a boy with his family. His experiences on that beautiful Greek island were fictionalised in his book, My Family And Other Animals, which became an immediate hit in 1956. The book has never been out of print and has sold more than a million copies. That’s because it conveys a dream world where Gerald roams free, swimming and sailing with no supervision, and befriending exotic animals, which he would bring home and install in the bath, to the annoyance of his frazzled mother and squabbling elder siblings: brothers Lawrence and Leslie, and sister Margo. It is a world where Greek peasants doff their caps to these eccentric English bohemians, and where adults — with their love affairs, money worries and everyday dramas — are viewed with bemused detachment by the child narrator. A care-free existence with sunshine and endless animals, it has all the ingredients for the perfect Sunday night drama. Of course, the book was previously turned into a ten-part BBC series in 1987 starring Brian Blessed and Hannah Gordon. In 2005, the BBC again adapted it into a 90-minute drama, this time with Imelda Staunton as Louisa, the Durrells’ mother. Now ITV has had a go, promising a drama ‘full of warmth, humour and fun’. In the book, and on TV, Gerald is a fearless ten-year-old with a fascination for animals. He makes friends with bats, spiders, and scorpions as well as a pigeon, Quasimodo. The eldest of the four siblings, Lawrence, known as Larry, is pompous, neurotic and too self-important (and lazy) to help with any practical tasks. When he causes a fire by falling asleep while smoking, he lies in bed giving orders to the others to put it out. Leslie, the second eldest, is quiet, brooding and obsessed with guns and hunting, while Margo is a moody teenage beauty, forever sunbathing on rocks and falling in love. In real-life, the children possessed all these qualities, but what you won’t see is what became of the Durrells after Corfu, which is a rather less rose-tinted tale of alcoholism, failed marriages and bitter feuds. Gerald Durrell grew up to be a volatile drunk whose obsession with founding his own zoo ruined his first marriage, and led him to set up with a young zoologist half his age. Drink was a big part of his mother’s life, too — a stint in India gave her a love of gin, which she would take to bed with her by the bottle — though champagne was her real passion, which she drank in huge quantities while pregnant with Gerald. Meanwhile, Lawrence Durrell became a famous novelist who wrote The Alexandria Quartet, a celebrated tetralogy from the Fifties, and Bitter Lemons Of Cyprus. He too loved a drink, and married four times. Their sister Margo ended up running a boarding-house in Bournemouth after two failed marriages. But it’s the middle brother Leslie, their mother’s favourite, who would cause the most upset, as we shall see. We should start with Gerald, who was born in India in 1925, where his father, a distant and often absent figure, was a civil engineer. Gerald was the couple’s fifth child — their second-born, Margery, died of diptheria in infancy — and his mother was drinking heavily by then. In 1928, when Gerald was just three, his father died of a suspected brain haemorrhage, possibly caused by over-working. His mother was shattered and took the family back from India to England. But life in suburban Dulwich didn’t suit free-spirited Louisa. Her three eldest children went to boarding school, leaving her with only Gerald for company. She felt lonely and even considered putting her head in the gas-oven. She consoled herself with gin, which she would take to bed with her youngest son. He would later recall waking ‘to find myself pressed up against her in a state of arousal’. This unhealthy set-up — which began when Gerald was five and continued until he was ten — reached a crisis point when Louisa had a nervous breakdown and went into a clinic, and a governess was appointed for Gerald. That governess — Miss Burroughs — was an unpleasant woman, who locked Gerald in his room at night without a bed pan, leaving him in great discomfort. His spaniel Simon was his only friend, but that came to a gruesome end when the creature was hit by a car, which ‘neatly crushed Simon’s skull, killing him instantly’. When some friends of the Durrells moved to Bournemouth, Louisa decided she would follow them, and, in 1931, bought a large Victorian house there. Gerald was sent to Wychwood Prep School, which he hated so much that, according to his biographer Douglas Botting, he would cling to the railings on the way, screaming and begging not to go. When he was wrongly accused of a misdemeanour and beaten by the headmaster, his mother decided enough was enough and took him out of school altogether — he would never attend another. Meanwhile, Lawrence was living in London, where he led a dissolute lifestyle, ‘whoring and drinking’, according to Botting’s biography. Louisa was happier in Bournemouth, but the family suffered from poor health. So when Lawrence and Nancy moved to Corfu, Louisa and the whole family went, too. The ensuing four years form the basis of Gerald Durrell’s The Corfu Trilogy, of which My Family And Other Animals is the first book. Durrell never pretended it was anything other than a work of fiction, and many of the stories within it never took place. But the sibling rivalry was true. The fights between the two eldest brothers were particularly fierce — Lawrence was the swaggering writer who enjoyed fame, money and had fashionable friends such as Henry Miller, the renegade American writer whose sexually explicit debut novel, Tropic Of Cancer, caused outrage. Leslie, not as obviously clever as Lawrence, felt belittled by him, and channelled his anger into a love of guns and hunting. But while Lawrence enjoyed huge literary success, his love-life was far less smooth. After divorcing Nancy in 1947, he married Eve Cohen — the model for the character Justine in The Alexandria Quartet — and they had a daughter Sappho. (Eve later had a breakdown and Sappho killed herself in 1985). After separating from his second wife in 1955, he married for a third time, in 1961, to a woman called Claude-Marie Vincendon. Durrell was heartbroken when she died of cancer in 1967. His fourth — and final — marriage was in 1973 to a gorgeous model called Ghislaine de Boysson. They divorced in 1979. As for Leslie, while his siblings enjoyed publicity, and all wrote about their lives, he shunned the limelight, perhaps with good reason. Later, he embarked on a series of mysterious semi-criminal enterprises involving luxury yachts and fraudulently called himself ‘Major-General Durrell’. While living at home he had an affair with his mother’s Greek maid, Maria Kondos, who was ten years older. He was already dating Doris Hall, the young manageress of the off-licence where his mother bought her gin. In September 1945, Maria had a baby by Leslie, in whom he took no interest. Leslie, meanwhile, married Doris Hall, from the off-licence, in 1952, and they moved to Kenya to run a hunting reserve. This ended in disaster when they defrauded an elderly woman of a substantial amount of money. When caught, Gerald was expected to foot the bill. He refused, and from that point on wanted nothing more to do with Leslie, fearing his brother’s criminal activity could harm his literary reputation. Lawrence also cut Leslie out of his life: on one occasion Leslie went to visit his brother, but Lawrence’s wife refused him entry, fearing he wanted to borrow money. In 1968, Leslie and Doris returned to England from Africa, penniless, and ended up working as caretakers for a block of flats near Marble Arch. By the time he died in 1983, while drinking in a Notting Hill pub aged 65, he still hadn’t reunited with his siblings and none attended his funeral. Though Margo’s life was also far from glamorous, she remained closest to Leslie and married twice, first to Gerry Breeze, a pilot with whom she travelled round Africa and had two sons. Her second brief marriage was to a trombonist called Max Duncan. Twice divorced and with two young children, she used her small inheritance to open a boarding house in Bournemouth, where ‘lodgers would mark my life like milestones’. These included jazz trumpeters, a battered wife and a Maltese transsexual. She later wrote: ‘My dream of wealth accumulating in the bank was forgotten as I came face to face with reality.’ She remained in Bournemouth until her death, aged 87, in 2007. Lawrence and Gerald, however, did lead the lives they yearned for. In 1951, aged 26, Gerald married Jacquie Wolfenden, a hotelier’s daughter whom he met while cavorting with three different ballerinas who were staying at her father’s hotel. Eight years later, Gerald launched the Durrell Wildlife Conservation Trust and, in 1964, the Durrell Wildlife Park on Jersey, which continues to attract thousands of visitors a year. Work also took its toll. Jacquie helped build up his writing career and encouraged him to open the zoo, which she ran with him. But as his television career took off, their marriage fell apart, Jacquie feeling more like a stooge than a wife. In 1976, he returned from a trip to Mauritius to find her packing to leave. Their divorce was finalised in 1978, and Gerald remarried, this time to Lee McGeorge, a 27-year-old zoology student from Memphis, whom, he calculated, would make the ideal co-regent of his zoo. Jeremy Mallinson, who worked for Durrell for 35 years, saw Lee as ‘a little bit of heaven coming into his life. I’m sure she gave him at least another ten years of life’. But even his new young wife couldn’t stop Durrell from drinking, leading to his long and painful death. He suffered seizures and abdominal pain, and was diagnosed with liver cancer in January 1994. A replacement liver was found, and he was flown from Jersey to London for the operation, sipping whisky on the plane. The operation was a success, but his pancreas had given up, and he died of septicaemia in January 1995, just after turning 70. It was a sad end to an extraordinary life, and a far cry from those halcyon, if somewhat idealised, days on Corfu. The Durrells starts on ITV tomorrow at 8pm.